It’s December! I love December. It may not be the most outwardly spectacular of months, but boy is it cosy. And if I haven’t let you know by now – I love to be cosy. Snuggly blankets are one of my favourite things – honestly – I can’t walk past something soft-looking without reaching out and touching it. And I simply adore the festive season – the baking, the spices, the crisp air – ah, I just love it! There truly are so many things to be grateful for in this life. The fact that I get to stand in my warm kitchen in my centrally heated house on a damp and gloomy morning and combine some of the most luxurious ingredients to create a spectacular Rocky Road Layer Cake is just a miracle. To contemplate the fact that it isn’t good enough is just ludicrous. It’s an expression of my creativity – however imperfect, however flawed, however haphazard. It’s a gift. Every single day here is a gift. Every word we speak or cake we bake or photograph we take is an expression of us. Uniquely us. So – this cake wasn’t perfect. Not even close. But you know what? It tasted awesome. What more do you need? The temptation to re-do this cake was strong. 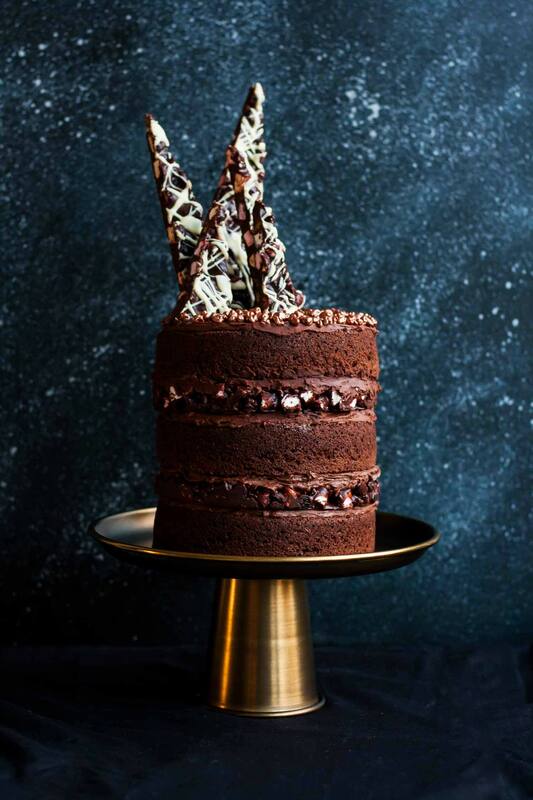 I experimented with a darker, moodier photography style for this cake and I’m not 100% happy with how it turned out. But frankly I just did not need another layer cake in the house (although most of this one was given away and not consumed solely by my husband and I)! And most importantly, I needed to accept this one for what it was. A delicious cake that just happened to be a little rough around the edges (in my eyes anyway – and I do have a strong tendency towards nit-picking my own work). And a testament to the abundance in my life. Speaking of abundance, we’re feeling seriously Christmassy right now. We haven’t put our decorations up yet but hopefully we’ll do it this weekend! I’m getting so excited about all of the festive eats that we’re going to be indulging in over the next few weeks. I just love this time of year so much! But onto the cake. 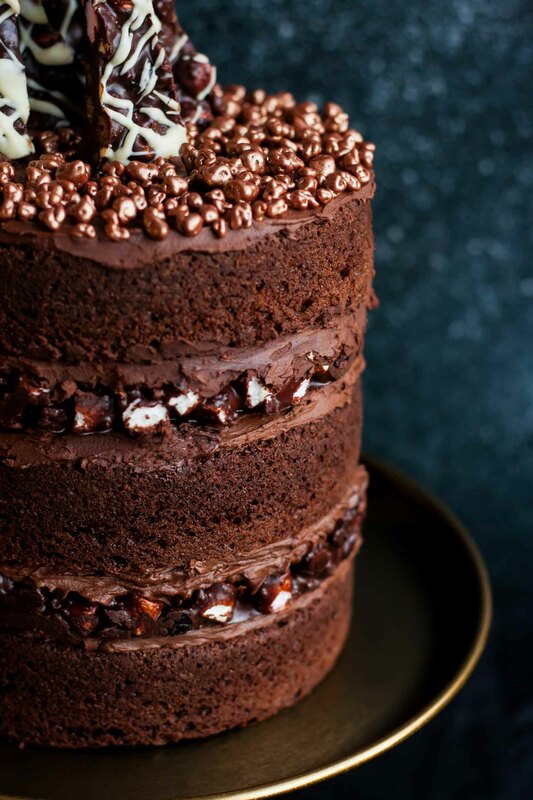 This Rocky Road Layer Cake is sheer decadence. 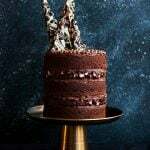 I mean it – we have 3 chocolatey sponge layers, alternated with layers of the most divine Christmas rocky road and sandwiched all together with a rich whipped ganache. And then! It all gets topped off with honeycomb pieces (because they were bronze and I had to have them but you could use any sprinkles you like or, of course, simply omit) and giant shards of more of that rocky road! Oh the rocky road. You seriously have to make it. One of my friends at work has a tradition of making rocky road and bringing it in either to give as gifts or as a snack for everyone to share. It’s the best rocky road I’ve ever had. 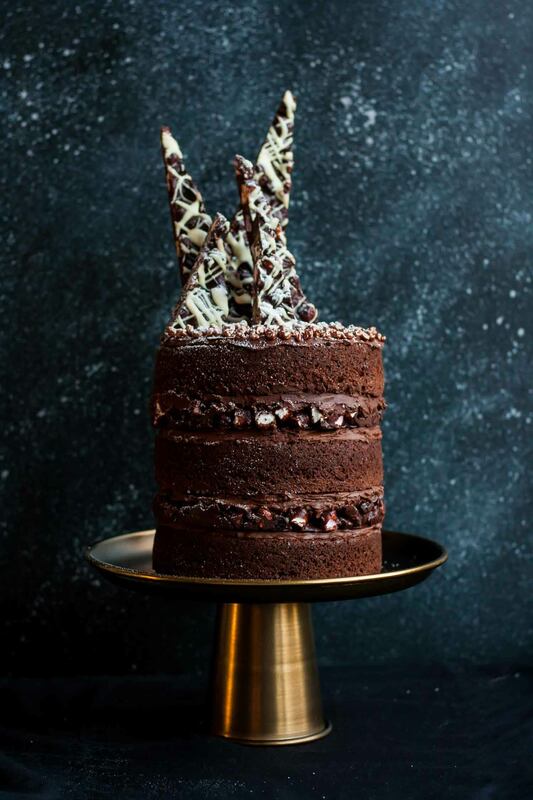 She uses Nigella’s rocky road recipe and so, naturally, I had to start there when creating the rocky road for this cake. Just a few simple tweaks resulted in the most insanely delicious festive rocky road that is seriously addictive – you’ve been warned! The ginger, cranberries and orange will get you so ready for Christmas! Preheat the oven to 160°C fan/180°C/350°F. Grease and line 2 6" loose bottomed cake tins. It's easiest to make this cake recipe in the food processor. Place the butter, sugar, flour, cocoa powder, baking powder and bicarb into the bowl of your food processor. Pulse until fine breadcrumbs are formed. Add the eggs into the processor one by one, processing briefly after each one. Finish by adding the milk and processing until just combined - you don't want to work the batter for too long. This recipe makes enough batter to bake 4 6" cakes - so unless you have 4 6" tins and ample oven space, bake two at a time. They should be ready after 20 minutes or if a skewer inserted comes out clean. Leave to cool for 5 minutes in their tins before transferring to a cooling rack. Clean the tins, re-line them and then bake the remaining two cakes. Leave to cool. Heat the cream in a small saucepan until just about boiling point, but not quite. Pace the chocolate into a heatproof bowl and pour over the cream and leave for 5-10 minutes. Stir until smooth and then stir in the sugar and salt. Leave to cool and firm up in the fridge for 1 hour. Transfer the cooled ganache to the bowl of a stand mixer fitted with the whisk attachment (or use an electric hand mixer). Whisk on high speed for about 1 minute until the ganache has turned paler in colour and has almost doubled in bulk. Set aside. Place the butter, chocolate and golden syrup into a heavy-based saucepan. Heat very gently, stirring frequently, until everything has melted. Take care not to overheat this - it should only be warm, not hot. I tend to remove the pan from the heated before everything is melted and let the residual heat take care of the rest. Place the ginger nuts into a large freezer bag and bash them with a rolling pin until you have a chunky rubble - you don't want the pieces to be too small. Stir the biscuits into the chocolate, followed by the mini marshmallows, dried cranberries and grated orange zest. Mix well. Have your 6" tins ready. Scoop out about a cup of rocky road mixture and spread out in the base of the tin. Repeat for the other tin so that you have two discs in total. Spread out the remaining mixture on a lined baking sheet. Refrigerate until firm - at least a couple of hours. Melt the white chocolate. Drizzle over the sheet of rocky road (not the round pieces) and refrigerate until set. Place one of the cakes onto your cake stand or plate. Add a dollop of ganache and spread out. Follow with a layer of rocky road and more ganache. Repeat until you have 3 layers of cake and 2 of rocky road. 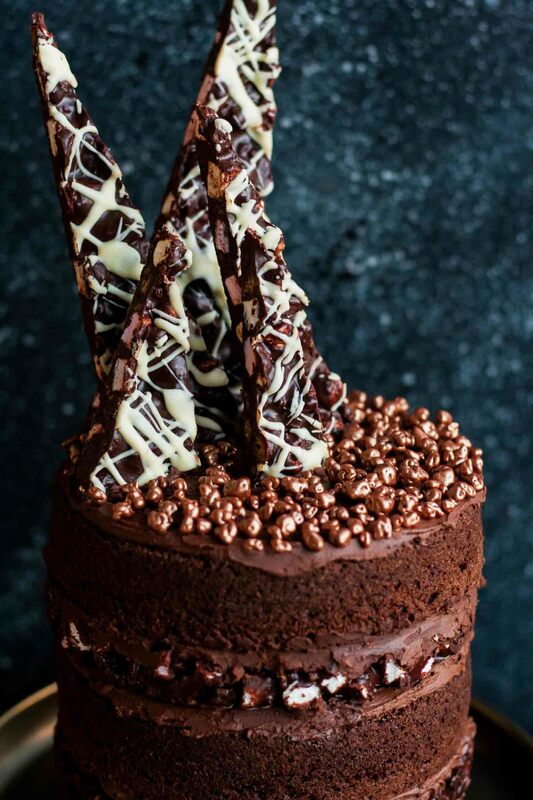 Spread a little more ganache on the top of the cake. Cut the leftover rocky road into various sized shards and assemble on top of the cake. You might have to prop them up with skewers. There will be leftovers but that is never a bad thing! Finish with some festive sprinkles of your choice. I'm not going to lie - this recipe is not perfect. Firstly, the sponges are super light and fluffy, but I wish I'd have gone with my gut and drizzled them with a quick simple syrup of orange juice heated with a little sugar. Ah well - next time. Secondly, I kind of wish I'd have made a chocolate buttercream instead of a ganache. But hey, the ganache is delicious - just be careful not to do what I did. I'm not sure where my head was, but I put it back in the fridge after whipping it and it set - not good! I warmed it back up again and it was fine but the texture wasn't quite what I'd hoped for in the end. I'd be tempted to up the quantity of the cream a little next time - maybe to 350 ml, just so that it stays a little softer. Like I said though, it was still fantastic as written! 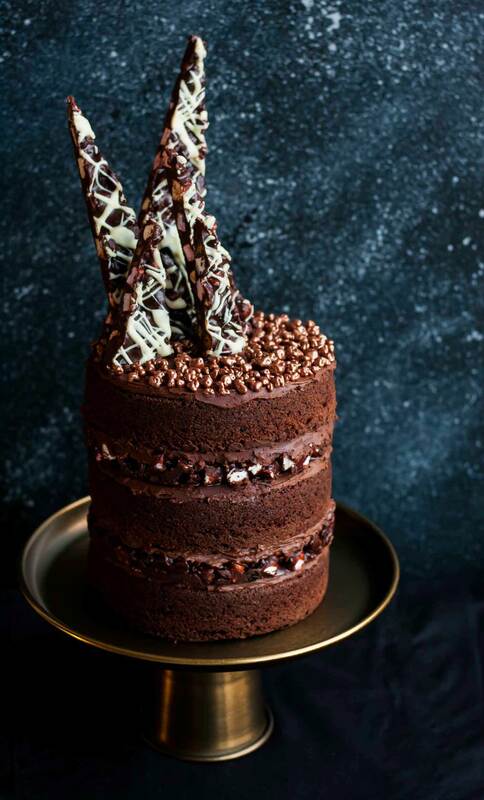 You'll have a spare cake layer (unless you want to go crazy and build this thing taller!) but it freezes well, just make sure you wrap it well. This looks incredible, don’t be so hard on yourself. I just saw it on Facebook and had to come and comment – honestly stunning! Thank you Callum – that’s really kind of you 🙂 I really appreciate you taking the time to comment! Oh my word. This looks so delicious! Dangerously delicious! Haha, thanks Elaine! I had to give most of it away quickly before I ate it all! 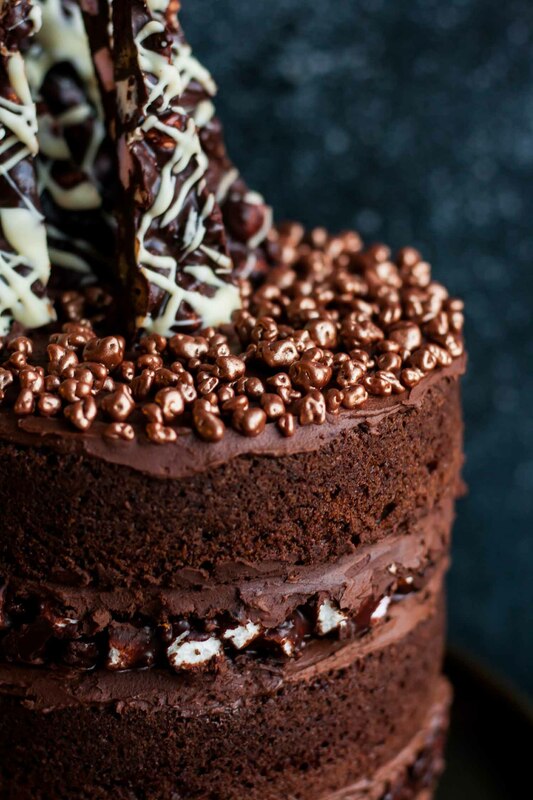 Stunning picture and yummy looking cake! love it! Now that is what I call a cake! Beautiful.